Chichester District first Farmers' Market was held in 1998. They have been held regularly every month since then, growing in size and frequency over time. Today the markets are held on the 1st and 3rd Friday each month in Chichester. Each market is attended by stallholders selling a wide variety of fresh quality produce. All our stallholders are required to grow, rear, bake, and/or preserve all their produce and are based within 50 miles of Chichester. The majority of our stallholders are primary producers offering a wide variety of meat, fruit, vegetables and eggs. Other types of produce include fish, cheeses, honey, cakes, chutneys and plants. In addition you will find a number of guest producers who provide specialities across the year. Stallholders at Chichester's Farmers' Market have been recognised for their high quality produce and hard work and have again been nominated for Farmers' Market of the Year at the Sussex Food and Drink Awards 2019. This is the second consecutive year being nominated, with last year being crowned Winners of the Farmers market of the Year. The ceremony is due to take place on Wednesday 15 May at Amex Stadium, where the winner will be announced. Fingers crossed for a double win. Chichester Farmers' Market runs on the first and third Fridays of the month, 9am until 2pm in the City Centre pedestrian area. If you would like to be updated regularly on the Farmers' Market and benefit from discounted product promotions then sign up to our Farmers' Market club. Members of the club will receive bi-monthly email newsletters about coming markets, details of produce for sale, special discounts, events and competitions. To sign up please contact the Farmers' Market. The District Council will not pass member's details onto any third party. Local food has less far to travel so can be delivered and sold soon after it is picked. The food should be fresh and at its best. Producers also can select varieties for flavour rather than those that travel well or have a long shelf life. These might be heritage varieties or just unusual. Seasonal food is usually abundant and delivers maximum eating pleasure for the best price. Fruit and veg in season will usually be field grown, which minimises their energy demand and carbon footprint. Local fruit and veg will usually be what is seasonally available in your area and it's much easier to buy locally to buy seasonal. Research shows local food can support hundreds of jobs at outlets, even in small towns, and this in turn supports producers in your area (we define local as within 30 miles of where you shop). This means the money you spend automatically circulates again locally and at least 2 to 3 times, boosting prosperity. This can really count in areas where there are no major industries or large employers. 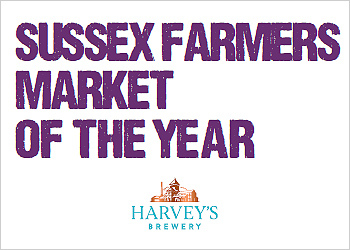 Our Farmers' Markets aim to support farmers and producers who are local to Chichester District Council. Our markets are very popular and for most of our markets we currently have a waiting list of stall holders who are wanting a pitch. We give priority to traders who are based within Chichester District, who are primary producers i.e. a farmer or grower who has grown or raised what they are selling and traders selling produce which is not sold by current stall holders. The pitch fee (from 1 April 2018) is £51 (+ £3 parking per market) for Chichester Farmers' Markets. For this you will get a canopy (size 3m by 2m). If you require electricity this is charged at £5 per market per day. If you wish to trade at our farmers' markets there are a number of conditions which you have to meet. Please read our Farmers' Market Traders Terms and Conditions document. If you are a trader selling alcohol you must comply with the Licensing Act. Please read our Alcohol Licensing Requirements document for further information. Contact the Farmers' Market Co-ordinator to check if your product is suitable for the farmers' market. Request an application form from the Farmers' Market Coordinator or download the form from here. Read the Summary Operating notes for Farmers' Market Traders. Return the completed application form with the additional paperwork to the Farmers' Market Team. Your application will then be held on a waiting list. We inspect all stall holders before they can trade at our markets, so when we have space we will be in contact to arrange this visit.